Kamran Pashais a writer and producer for NBC's highly anticipated new television seriesKings, which is a modern day retelling of the Biblical tale of King David. Previously he served as a writer on NBC's remake ofBionic Woman, and on Showtime Network's Golden Globe nominated seriesSleeper Cell, about a Muslim FBI agent who infiltrates a terrorist group. Sign up to receive email updates from Kamran Pasha! "This is a suspenseful, action-packed historical [novel]. 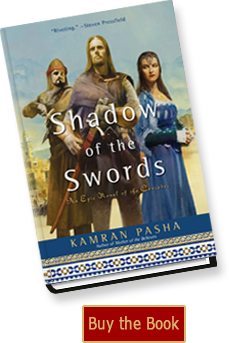 . . Best, however, is Pasha's clear depictions of Saladin's and Richard's astute political and military leadership styles as they rally their forces to fight yet another religious war neither would win."